Your dog is your best friend, your companion, and your family member. And, of course, you want him to be healthy and happy. But if you notice that your dog is losing hair on his tail, you may start to worry about just what's going on with your pup. There are several possible causes for this issue, so you'll need to do a little detective work to get to the root of the problem. A bald spot on a dog's tail is most often due to allergies. Dogs can become allergic to any number of allergens, including ingredients in their food, grooming products, pollen, and more. If you've recently introduced something new to your dog's environment, like a new type of treat, a new food, or a new shampoo, this could be causing the issue. Try removing the potential allergen and see if your dog stops losing hair. Flea bites can also prompt allergic reactions in dogs. According to WebMD, a sensitive dog can itch for days after receiving a single flea bite. If your dog has fleas, she may scratch incessantly at the area, creating a bald spot on her tail. Treating your dog's flea problem can help to relieve the allergies, but if she is having an allergic reaction to something else, you may need some veterinary help. Your vet may prescribe a topical ointment or medication and will help you try to identify the cause of the allergy so you can eliminate it and stop your dog's hair loss. Hypothyroidism can also result in a dog rat tail appearance or a bald patch on dog hind legs and hips. According to Web DVM, hypothyroidism commonly results when a dog's immune system attacks his thyroid gland tissue. This results in a reduced level of thyroid hormone, which can cause issues such as anemia, muscle weakness and atrophy, and lethargic behavior. Because hair growth depends on sufficient levels of thyroid hormone, when a dog has hypothyroidism, he may develop a nearly bald tail. His hair may come in thinly on both sides of his abdominal region, and the backs of his rear legs may lose hair. Hypothyroidism most commonly affects Labs, Golden Retrievers, Cocker Spaniels, Dachshunds, Boxers, and Rottweilers. If you suspect that your dog may have this condition, take him to your vet. Your vet will order a blood test to confirm the diagnosis and will treat your dog with an oral thyroid hormone to help regulate his thyroid levels. Mange can also result in a dog losing hair on a tail. This parasitic skin disease can make your dog very uncomfortable. There are two main types of mange that affect dogs, according to Canna-Pet. Demodectic mange results when a dog's immune system is compromised, and mites start to overtake her fur and skin. The condition can be localized to one area, or it can spread throughout her body. Demodectic mange can cause hair loss, bald spots, sores, lesions, and redness, among other symptoms. 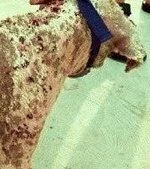 Sarcoptic mange, on the other hand, is caused when a dog contracts canine scabies (burrowing mites), usually from interacting with another dog who is infected. The mites mate, then the females burrow into your dog's skin, planting their eggs which hatch three-to-10 days later. The process is extremely uncomfortable for your dog, and he will likely scratch at the affected areas. Sores, hair loss, itching, a skin rash, and scabs can result. Mange of either variation requires veterinary treatment. Your vet will take a skin scraping to determine the type of mange present, and may prescribe both topical and oral medications. Another potential cause of a bald spot on a dog's tail is Cushing's disease. Pet MD states that this endocrine disorder results when a dog produces too much cortisol, causing a variety of symptoms. Cushing's disease can cause hair loss, obesity, increased hunger, and many other symptoms. To diagnose Cushing's disease, your vet will perform some blood work, and probably a urinalysis. Managing Cushing's includes regular monitoring, and sometimes a vet may prescribe trilostane to help regulate your dog's symptoms. Whether you feel your dog has Cushing's or another condition, be sure to consult with your vet to get to the root of your dog's hair loss.